The most remarkable Buyer/Seller Lead Generation Tool included within all our real estate platforms! Are you tired of the same old marketing you have used that costs you time and money? Does what you use enable you to peer into the thoughts and actions of future buyers and sellers? Do you stay front and center with all contacts so you are there when your consumer is ready to move? In today’s market there are many choices to buy leads and some work and yet, many do not! How would you like to see how you and your agents can eliminate the hours of marketing to people who would never do business with you anyway? 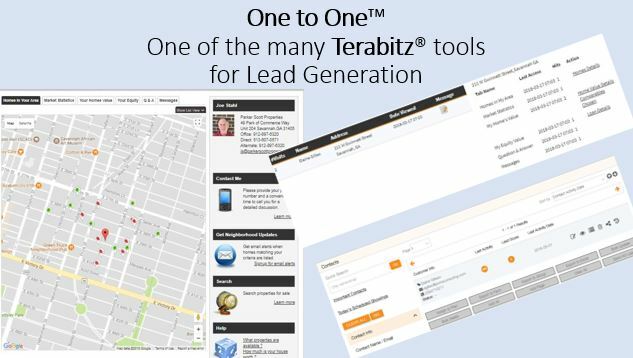 Take a test drive of Terabitz’s One to One to see how you can engage the consumer in every circumstance (buying, leasing or selling) to actually capture more profit and a higher margin. Contact me today for your preview here! Agents. Teams and Smaller Brokerages we have a solution for you at a price you can afford! View our HouseTouch now!